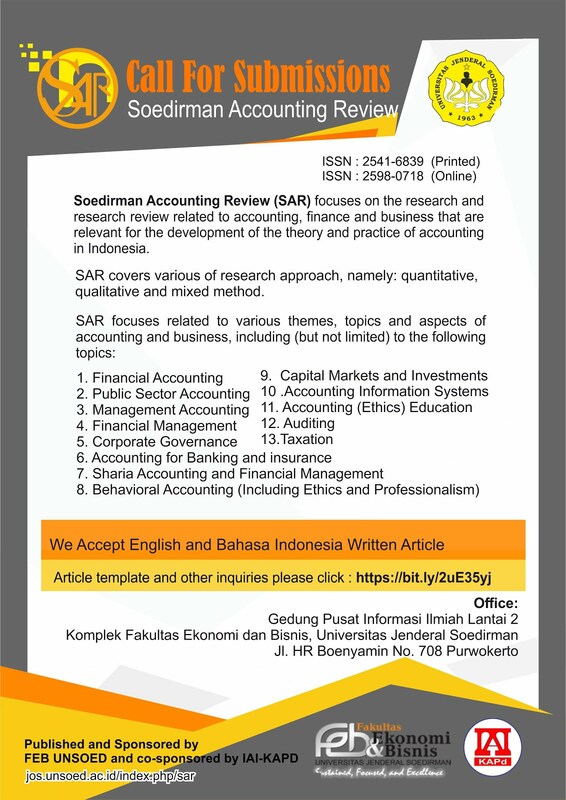 SAR (Soedirman Accounting Review): Journal of Accounting and Business focuses on the research and research review related on accounting, finance and business that are relevant for the development of the theory and practice of accounting in Indonesia. SAR covered various of research approach, namely: quantitative, qualitative and mixed method. SAR focuses related on various themes, topics and aspects of accounting and business, including (but not limited) to the following topics: Financial Accounting, Public Sector Accounting, Management Accounting, Sharia Accounting and Financial Management, Auditing, Corporate Governance, Behavioral Accounting (Including Ethics and Professionalism), Financial Management, Accounting (Ethics) Education, Taxation, Capital Markets and Investments, Accounting for Banking and insurance, Accounting Information Systems.